Landscape painting techniques are not just about reproducing a given landscape, it's also about showing the way you see things. Perspective is an important part of all landscape painting techniques - and there are several kinds of perspective. In landscape painting there’s a specific place, on a specific time, seen through the eyes of a specific individual (you, as a painter). It’s good to first learn some general rules. It may take a few studies, but once you learned to apply these rules, you can bend them, and still be convincing in the way you depict things. That’s when painting turns into art. Doing studies is something like, learning to walk before learning to dance. If you take your time for it, you can have fun doing it. In flat lands, the horizon is about 3 miles away. The last 2 miles take up only a small part of your landscape, near the horizon. For a sunny sky, take cobalt blue, mixed with white. One little thing - most oil painting colors with the name 'cobalt blue' are too dark. The most ideal cobalt blue is "cobalt blue light" from Schmincke. Another good option is "cerulean blue" (a shade between turquoise and cobalt blue) or 'cyan', a color name that indicates a specific hue. You can also mix it yourself. Turquoise appears only as a sky color in either very hot or very cold weather conditions, and then mostly just above the horizon. Ultramarine blue can be made lighter with white, but then it still has a bit sad, rainy look. The atmosphere is usually lighter just above the horizon, because the light reflects back from the earth. 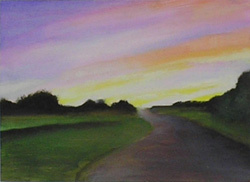 Let it very gradually go lighter towards the horizon by adding white, and most of the suggestion is done. When you paint clouds, put them into perspective. The ones above your head, near the top of your painting, are bigger than those close to the horizon. At first, don’t let clouds touch the horizon. When the sun is high and shining, clouds have shadows. The ones near the top are seen from below. You look at their bottoms, where the shadow is. The ones nearer to the horizon are smaller and keep their shadow underneath. Try to look at the clouds as often as you can. Analyze their colors and shapes, their tonality (light and darkness). When you've seen it, and unterstood it, you can paint it. When you define a horizon, the most harmonic proportion to divide your canvas is roughly 5:8. That’s the golden mean or ratio, a proportion that is found everywhere in nature (especially in our own average human bodies…) Landscape painting techniques are all about suggesting space. There are some simple tips and techniques to do that. Most of them depend on the laws of perspective. Put this knowledge into your strokes, by doing big ones near the bottom, and tiny ones near the horizon. You can get a painting to look realistic, even if you did only paintstrokes, when you communicate this idea of things going smaller towards the horizon. If you put the horizon lower, you create a view from a low standing point, or the feeling of looking up to the sky. If the horizon is very high, you create a feeling of looking down from above. On color in landscape: there are a lot of preassumptions in our head about the way things look – the sky is blue, the sun is yellow, treetrunks are brown and leaves are green. But is it, really? A good painting training, to look around as good as you can, and define the hues and colors around you. Which can be quite puzzling… I’m still not sure about the hue of certain clouds at a sunset (a thinned dark orange?). It's a great challenge, figuring out ways to reproduce these color by putting two or three layers over one another. If the sky has a certain color, it shines on all the landscape - except for the parts where there is another light source. Sometimes there are interesting situations, where you look a grey sky, but behind you there’s an orange sunset, setting the trees in an orange glow. Take pictures, if you see these kinds of weather conditions. 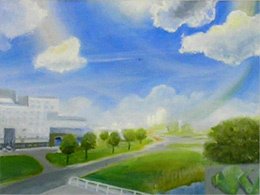 Sky colors are a special area in landscape painting techniques. Atmosphereal colors don't mix like paint colors do - sometimes even the opposite. Water has its own color (usually dark green), but it also reflects the color of the atmosphere. That’s why water, in our minds, is blue. First paint the color of the water itself (the color it has when you look into it), then dab the sky-colors on it, in the form of eventual ripples or little waves. Flat is OK too. Things on the waterside reflect their image in the water, but always in a rippled way. And: the reflection always point straight at you. If there is a lot of water, it reflects the light back into the atmosphere, creating an immense clarity. The uniqueness of the light in Holland and Venice is wellknown – and caused by large amounts of water in the landscape. 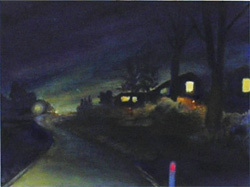 Check the paintings of Dutch painter Jan Voerman to see what that looks like... In his landscape painting techniques, he creates an enormous clarity by glazing. He’s my alltime favorite. Here you'll find my art gallery, with more examples of landscape painting , and landscape-underpainting studies.